RD6 & LDT10 from Lika are the complete system for efficient changeovers: processes benefit from quicker adjustments, reduced downtime and less waste material. RD6 rotary actuator combines brushless motor, real multiturn 28-bit absolute encoder, position and torque closed-loop controller and fieldbus interface in the single compact package. Its “all-in-one” configuration ensures dramatic simplification of integration, easy installation and quick cabling operations. It is highly flexible and ideal to automate also existing manual applications. It is available in two sizes (157 W-0.5 Nm or 250 W-0.8 Nm at 3,000 RPM) and an extensive range of Ethernet and bus interfaces (EtherCAT, POWERLINK, Profibus, CANopen and Modbus). LDT10 HMI touch panel is the perfect match to get more efficient and accurate operations, in particular in multi-axis systems. 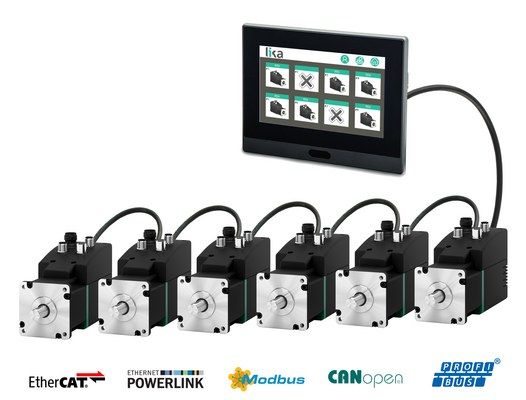 Target position and configuration parameters are stored into recipes and all actuators in the network are operated at the same time, in just one touch of the HMI. No need for knowledge of PC programming. RD6 + LDT10 are ideally suited for printing machines, packaging and bottling lines, woodworking industry, plastic industry, stone and metal processing industry.